In today’s article, the focus is on INEQUALITY. According to the CPF Annual Report in 2011, where the distribution of the monthly wages of Singaporeans were last available, 458,257 Singaporeans were earning less than S$1,500 every month. This represents 26% of the Singaporean and PR population. If you compare the poverty rate of 26% with other high-income developed countries, the disparity will be even more shocking. In fact, Singapore’s poverty rate of 26% is as bad other poor countries, and would be even comparable to Cambodia, and worse than Philippines and Pakistan, some of the poorest countries in the world. And if you look at the total poverty rate of the high-income countries of 11%, Singapore’s 26% becomes completely out of proportion. We have a poverty rate that is more than 2 times higher than the average of the high-income countries! I looked at the statistics from 2002 (the earliest that comparable data can be found). 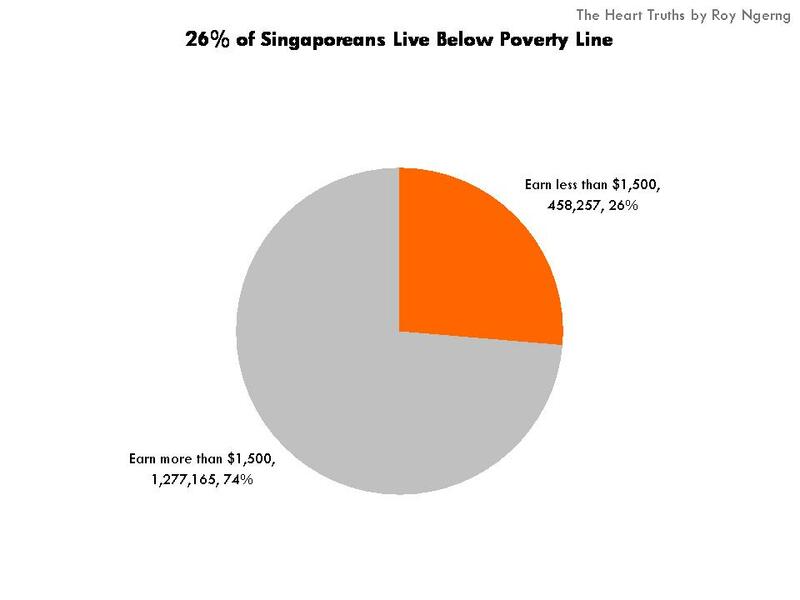 In 2002, the median income is S$2,083, which means that the poverty line was $1,000 in 2002. In 2002, there was 16% of Singaporeans who earned below $1,000. As such, you can see that the poverty has grown from 16% in 2002 to 26% in 2011. From 2002 to 2011, the poverty rate increased by 1 percentage point, on average every year. 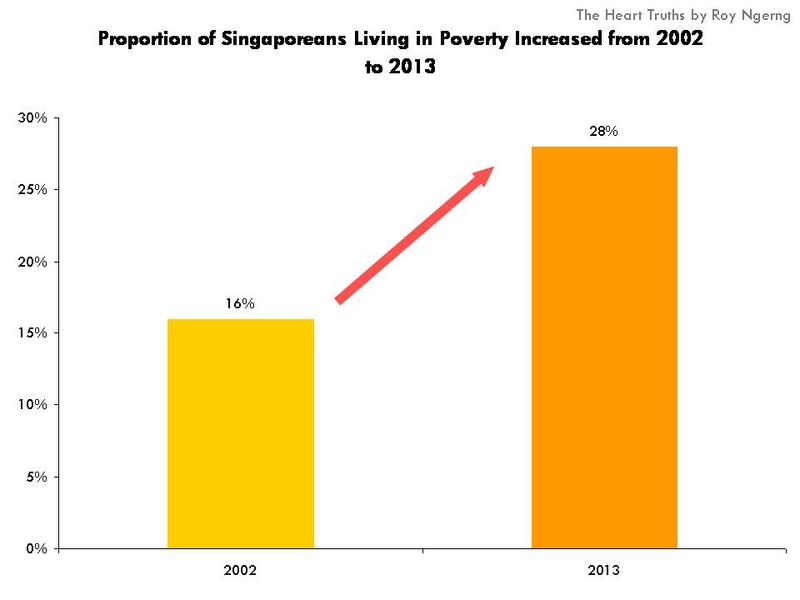 Fast forward to 2013, does it mean that 28% of Singaporeans are living in poverty today? (4) How PAP Created Inequality in Singapore: Will Singapore Collapse? What is worse is that the income inequality situation is driven by how the richest in Singapore pay themselves the highest salaries among the developed countries and one of the highest in the world. It is also exacerbated by how the PAP also pegs their own salaries to the richest in Singapore. But not only that, when PAP increased their own salaries, income inequality also shot up in the same year. 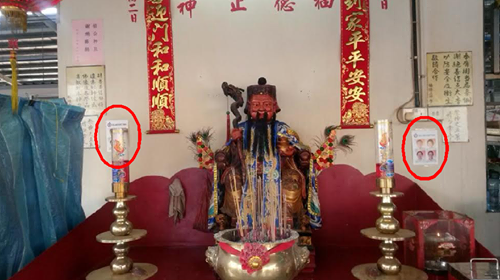 (5) The Singapore Government Caught Pretending! The government has been driving down the Gini coefficient from 2008 to 2010 to 2013! In which country do you see the income inequality suddenly become lower and lower in each new report that the government puts out? 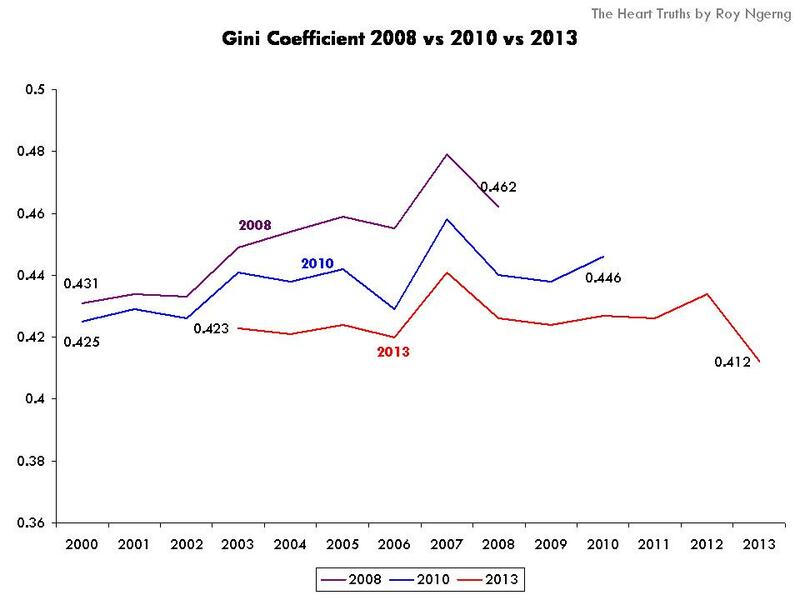 In the 2013 Gini coefficient, the line is a lot flatter than the lines in 2008 and 2010. Suddenly, it looks like income inequality has never grown in Singapore before! It is thus highly worrying that the government deems fit to adjust the statistics as and when they deem fit, without the relevant or corresponding explanation as to how this is done. It is worrying because then – would we be able to have a good gauge as to how people are truly feeling in Singapore? For example, if indeed, the high inequality in Singapore has resulted in a low intergenerational social mobility, a responsible government would step in to mitigate this. However, for the Singapore government, instead of stepping in to mitigate, has their solution been to simply tweak the statistics? Make the statistics look good, and people will naturally feel better as well. So, how can the government be so frivolous in its definition of income inequality and how can the computation change year after year, and suddenly become lower and lower? 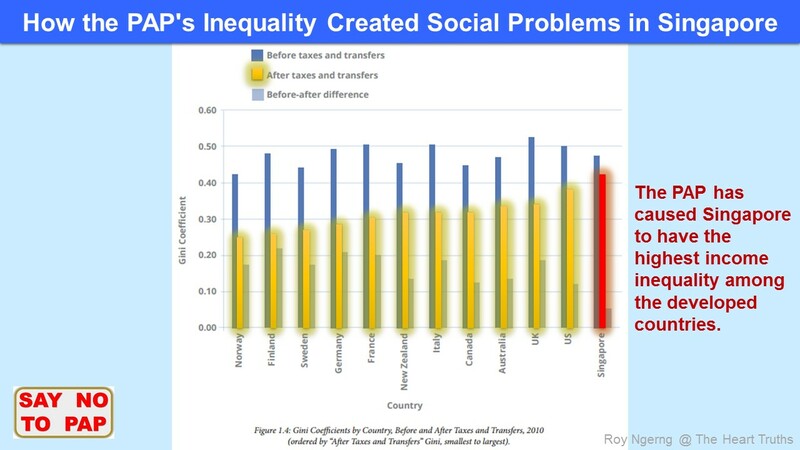 Today, Singapore has the highest income inequality among the developed countries. The PAP also spends the least on social protection, healthcare, education and pension for Singaporeans among the developed countries, and one of the lowest in the world. In fact, because the PAP spends so little but makes low- and middle-income Singaporeans earn the lowest wages among the highest-income countries, Singapore also has the highest rich-poor gap. On top of that, every time the PAP increased its own salaries in 1984, 1994, 2000 and 2007, income inequality increased as well. So did the income share that went to the rich. 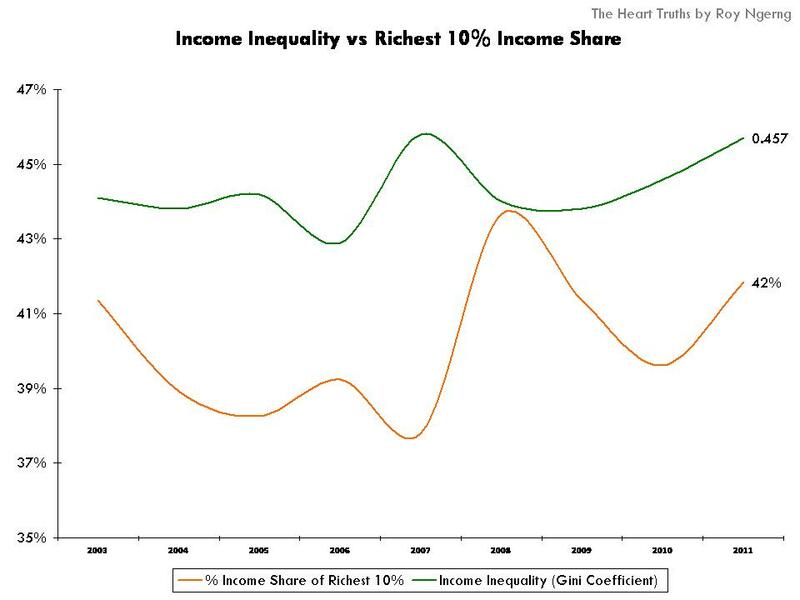 The share of income that went to the richest 10% in Singapore increased from 30% in 1995 to 42% in 2011. The PAP keeps increasing its own salaries that today, it earns the highest salaries in the world. Meanwhile, Singaporeans earn one of the lowest wages among the highest-income countries and have the lowest purchasing power. And because Singapore has become the most expensive country in the world, where Singaporeans have to pay the most out of our pockets for healthcare and education, have to pay for the most expensive public housing in the world and have one of the least adequate pension funds in the world, 30% of Singaporeans today live in poverty. The income inequality and social problems in Singapore are all created by the PAP. The PAP no longer cares about Singaporeans and have allowed Singaporeans to languish in our own country. The solutions are out there. The poor do not need to be poor – the poor are made poor because of the uneven wage distribution pattern, largely attributed to the executives wanting to pay themselves high salaries. Also, bringing more billionaires or millionaires will not help create jobs. Increasing the purchasing power of the masses is what will. To correct the deeper causes of poverty and inequality, a very clear solution is to pay executives on the top much lower salaries and the poor much higher ones. Reich had also called for (higher) minimum wage. The current wage imbalance has also been shown to be detrimental to the economy in the long term. Only by decisive action and wage correction towards wage parity will we be able to move Singapore’s economy in the right direction. None of the links you made to support your statistics work. They are all broken. Serious credibility issues. I am not sure where you pulled it out from. Be it that may, I agree income inequality is a very real issue. As a person standing for elections you should explain us how your solutions will work. How will you force companies to narrow income inequality? What if the mnc leave due to this and minimum wage, how will you convince them? How are you going to fund $500 pension and $300 per child handouts? How will you return cpf when you use the budget for these handouts? Will you raise taxes? Typical of Roy. You’ll also see that, on the rare occasion when his numbers have a source, Roy is very selective with the truth. He also, as you pointed out, neglects to spell out how his “great” ideas will be funded. He has previously said he would use our reserves but that’s another fallacy – any additional pay-outs ultimately mean higher taxes. Average workers in Scandinavia may earn more but they also pay much higher taxes than Singapore. There is no such thing as a free lunch just as there is no such thing as a perpetual motion machine (although Roy does seem to keep going on and on and on with the same old half truths). 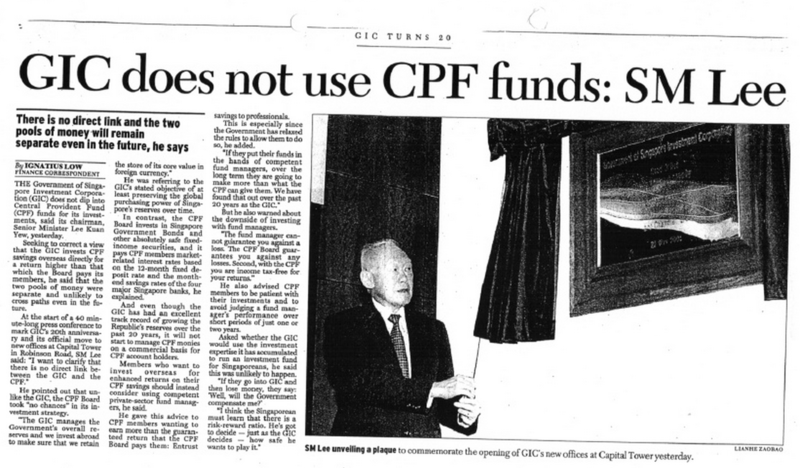 And despite the fact that Roy’s article above has nothing to do with CPF (for a change) and the fact that CPF’s investment in government bonds has been explained in clear detail in recent years, you still keep posting this OLD newspaper article (from 2001) that was written by a financially illiterate reporter who actually got some of the facts wrong. You are typical of the Roy’s little rabid army – despite overwhelming evidence to the contrary you will fasten on one piece of “evidence” as “proof”. Wake up! To Concerned citizen n Roy. nothing is free.So each new citizen should pay his own cost.We welcome all new citizens who pay their share. Each new citizen does pay their own cost – through taxes! However, using your logic, a new citizen may benefit from a share in our reserves but Singapore also saves the cost of raising a child to productive adulthood – estimated at circa $900,000 (of which $400,000 is state subsidies). This means bringing in well educated young adults is a smart decision economically (but I’ll agree this needs to be balanced against the social costs). Thanks for your reply: a new citizen may benefit from a share of our reserves PLUS $400,000 OF STATE SUBSIDIES. Just use all this money for citizens. Then opposition DIAM DIAM. Dr. Chee has mentioned he would rather reveal the whole truth about his policies than to get elected as MP based on lies alone. Decide which opposition is better. Roy has been lecturing only half truths. Roy has to reveal the full side of all his policies. Singaporeans need to hold these guys accountable for what they say. Mindlessly voting for *any* opposition will not help Singapore. Good opposition in parliament will command the respect. Selfish thugs such as Roy cannot provide the voice for you because he lacks credibility. I agree. I originally tried to reason with Roy but he is not a reasonable person. 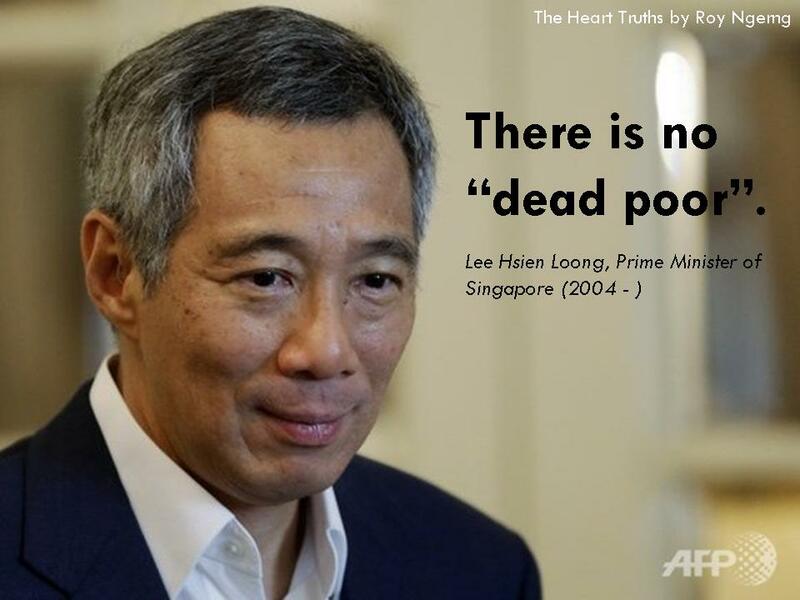 He has no interest in the real level of poverty in Singapore or the real anything. He has his agenda, his highly selective statistics (that’s being charitable), and no interest in how the real world works outside of his fish bowl. Should put this way. 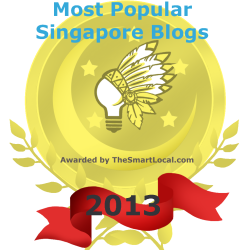 It is Singaporeans choose to be poor as they want to vote for PAP. Some of them just blindfolded and just trust and vote for PAP. Your blog posts surely enlighten most of the people if they know about it. Why make life so difficult for Singaporeans and the poor people. And signing off the 6.9 million population making life even more difficult. Give us a break. 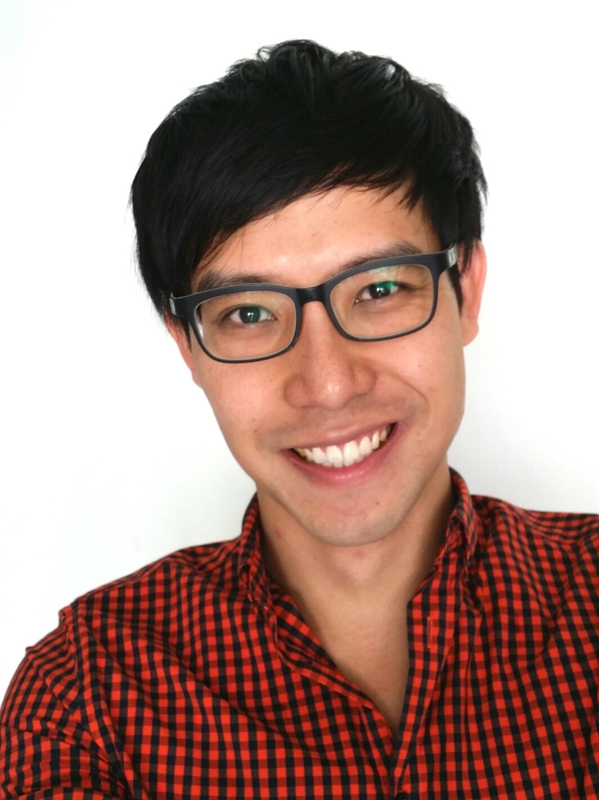 I believe Singaporeans just want to live a simple life with enough money to retire. Materialistic and monetary benefits are just temporary. Why not, I mean why should the PAP be so greedy and make Singaporeans suffer and suffer when I believe the PAP has already enough money to live off their lives until they die. Even you got billions of dollars in your bank it is useless. Why not help the needy and low/middle income groups in Singapore? It is time for a change to change millions of Singaporeans life from suffering. What Does the Reform Party Ang Mo Kio GRC Team Want to Do for Singapore?